What isn’t good smothered in onions and mushrooms?! This quick chicken dish tastes like a restaurant meal, but it’s even better because it’s cooked in plenty of grass-fed butter! Using canned coconut milk for the sauce, this is one creamy dish that will keep you fat-burning all day. Don’t sleep on the nutrient density of crimini mushrooms, either! Just one cup of these mushrooms is an excellent source of 15 different vitamins, minerals, and antioxidant phytonutrients. 100 grams of criminis will get you well on your way to your recommended daily calcium, potassium and selenium intake. Fun Fact: With butter color ranging from white to deep yellow, it’s actually the yellow butter you want. This creamy mushroom chicken dish tastes like a restaurant meal, but it’s even better because it’s cooked in plenty of grass-fed butter! Heat a cast iron skillet on medium heat. While it comes to temperature slice your mushroom and onions. Once your skillet is hot, add in two tablespoons of butter. When melted add in the sliced mushrooms, sprinkle with ¼ tsp salt. Sauté until browned, then add in the onions. Keep stirring until softened, about 6 more minutes. 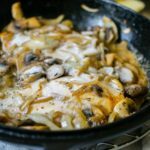 Remove the mushroom and onion mix from the skillet. Add in the last tbsp. of butter. Sprinkle your chicken cutlets with the remaining salt and thyme. Place in the skillet side by side. Cook for five minutes on one side. Then flip over. Cook another 5 minutes. Then add the mushroom and onion mix back in. Pour the coconut milk right over it. Make sure you shake your can so you get a good mix of coconut milk with fat. Let simmer for one minute, remove from heat and serve! Perfect saucy protein to go with a big green salad! This recipe turned out AMAZING! I’m new to working with coconut products, and I was skeptical that coconut milk would be good with the mushrooms and onions….. served this to a non-keto friend with garlic/butter/parmesean sauteed zoodles as a side and we were both licking out plates. Great stuff! Delicious, didn’t have coconut milk so I used almond milk and coconut oil. Hi Derek, our developers are working on site updates and fixing recipe issues. The recipes should be back tomorrow! Check back in a bit. Thank you! That was fast and yummy. I made this with a vegetarian chicken. Don’t be afraid of the coconut milk. It’s very subtle and gave a rich taste. My husband who is a carnivore loved it. I served it with wilted kale. Definitely making this again! Incredible. You cannot taste the coconut at all. Could eat this every night. Yum!! How many servings? Or is the nutritional info. fat, carb, protein, counts for whole reciepe? Hi Cass, this recipe yields 2 cooked and the nutritional info is per serving. I don’t normally leave comments on recipes because of making the time to do so with 3 kids can be tough to remember, haha, but I HAD to leave one here. I very much hate mushrooms and usually stay away from them at all costs, but I wanted to give this a shot because I wanted to find a way to get my potassium up. I can not rave enough about this recipe!! It was so gosh darn good I caught myself starting to lick my plate… I went to wash it off and couldn’t help myself. I took a spoon and started drinking the left over sauce out of the pan. We will be making this over and over! DELICIOUS!! We added garlic to the onion mushroom mix. Def jerky adding this to the dinner rotation!